Do you use apps on your mobile device? Statista.com reports there are 2.0 million apps in Apple’s App Store and 2.2 million apps for Android users. There is an app for just about everything. 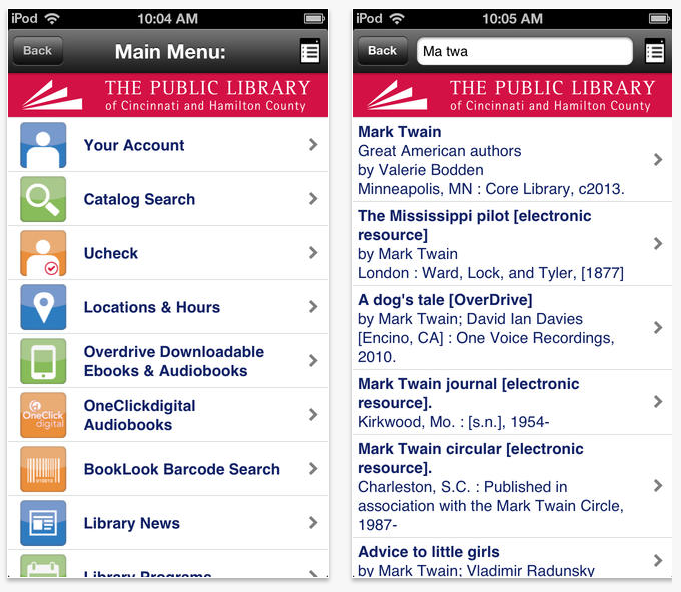 Apps make looking at information easier. Statistics show that mobile users are using their devises via an app 88% of the time and on a web browser only 12% of the time. The most popular app is Facebook per ComScore! Easily find public services that you may need to notify (transportation/engineering, buildings/inspections, health, etc… The service requests go directly to a request system. You can add a photo if you like when making your request. 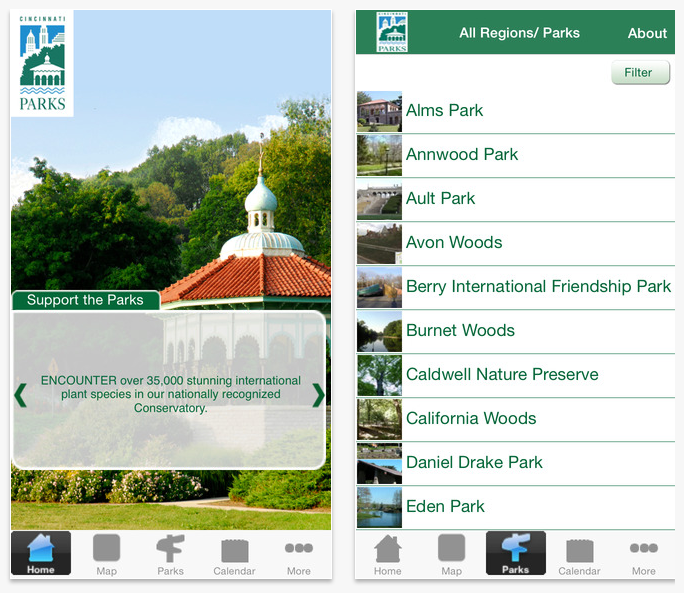 There are 70 parks and 34 nature preserves to enjoy in Cincinnati. Use this app to get directions, trail maps, coupons as well as view upcoming events. 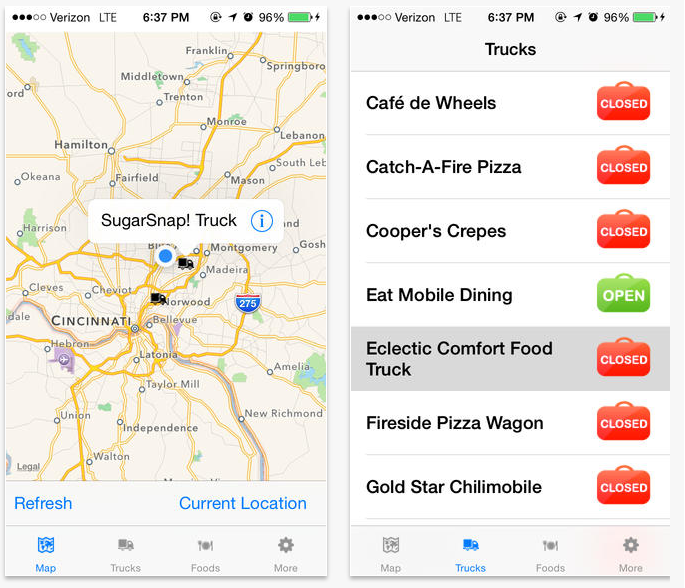 This app helps you navigate downtown Cincinnati: eat, shop, stay and play. You can search by type of cuisine, see hours that businesses are open and have links to major events. Order tickets, upgrade your seat on the ball park or explore the park with maps and concession menus. You can even find info on your favorite player. 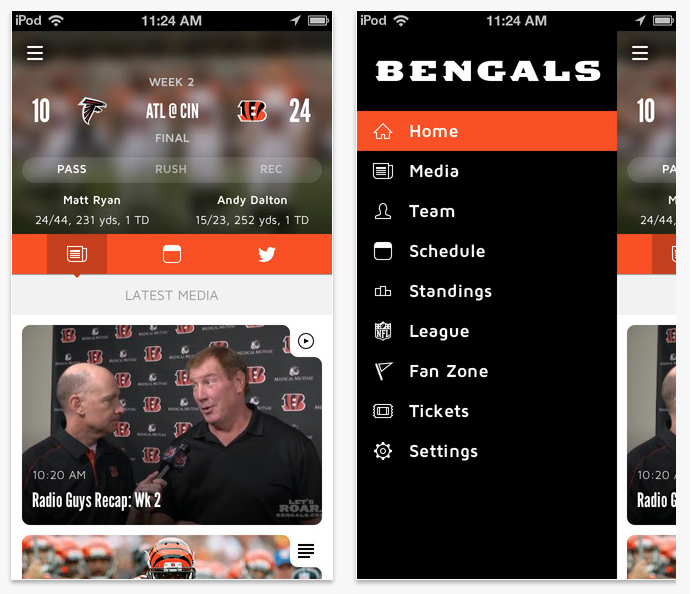 Roar for the Bengals with this app. See breaking news, foot ball stats and video. You can also enjoy post-game blogs. This app aggregates Bengals tweets, too. Readers love this app. Search the catalog and place holds, see hours for the branch locations, scan any book and see if it is available and look at the library’s calendar events. 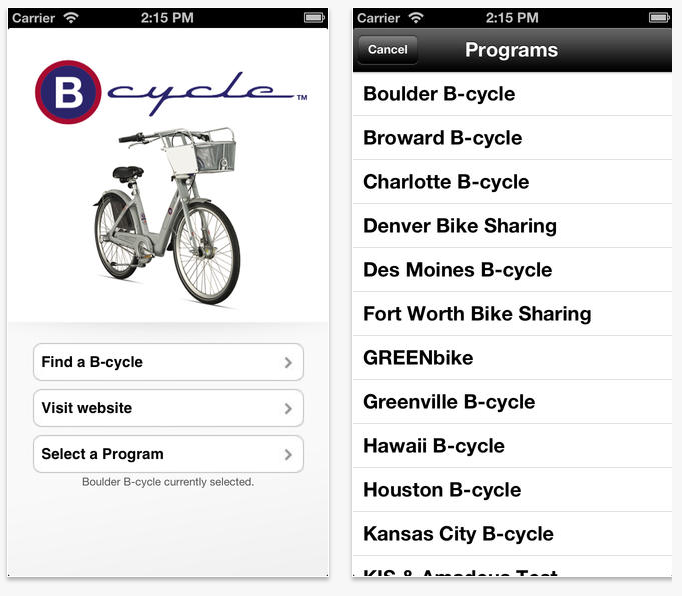 If you enjoy renting of the red bikes, this app will show you the closest Red Bike Station. Metered parking in Cincinnati is easy with your smart phone. 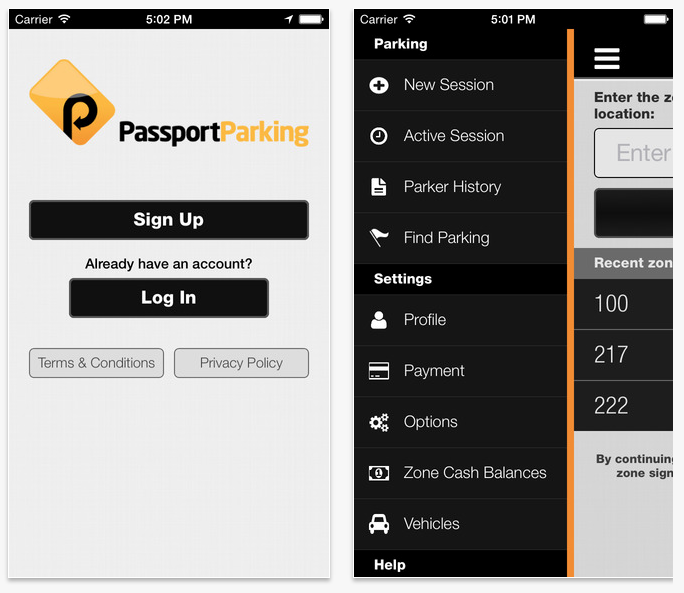 If you are using one of the 4,000 street meters in the city use the PassportParking mobile pay app. You can also extend your parking session to the maximum time permitted. And, you will receive a 10-minute reminder before your parking session expires. 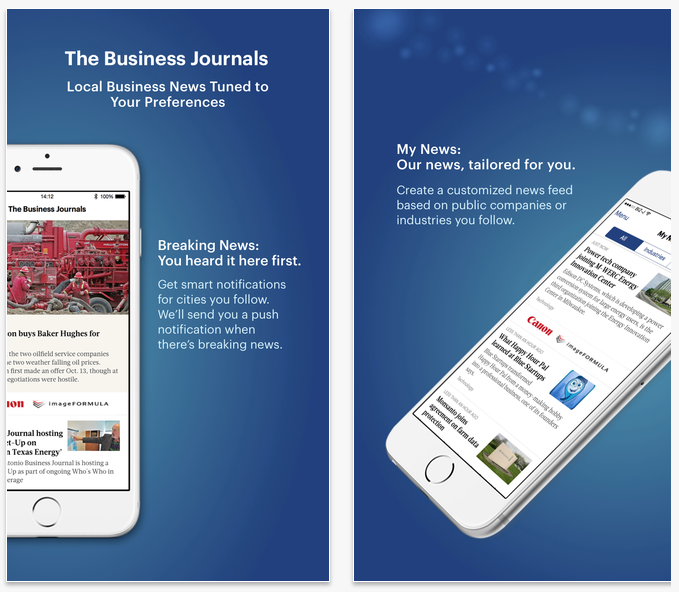 Stay connected to local business news. Hungry? Find a local food truck! 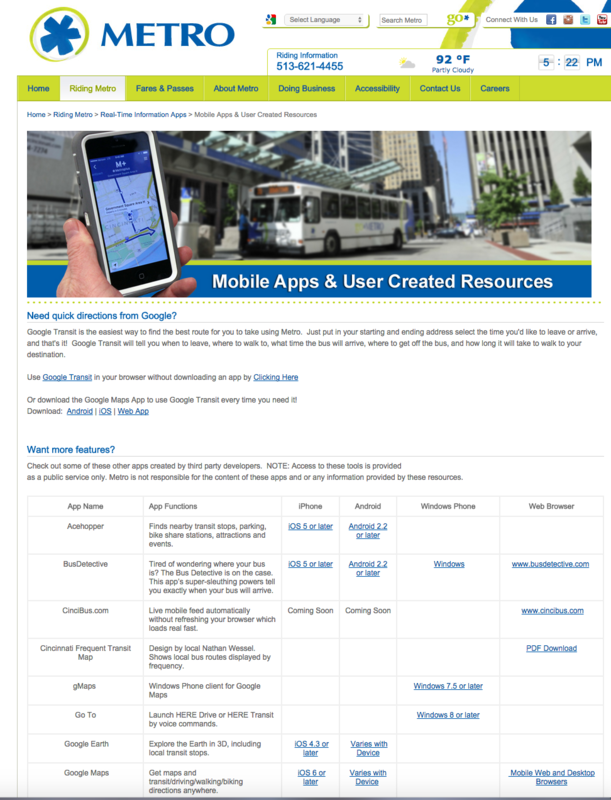 Although the Cincinnati Metro buses have not created their own app, they have a web page that showcases some third-party apps that one can use here. This interactive app can help you with a self-guided tour of the city. Find three walking tours for downtown. Information about local restaurants and pubs along your route is also available on this app. This app lets your coordinate your rides between the Cincinnati Metro bus service and the Cincinnati Bell Connector streetcar systems. Plan your trip and pay for your fare! 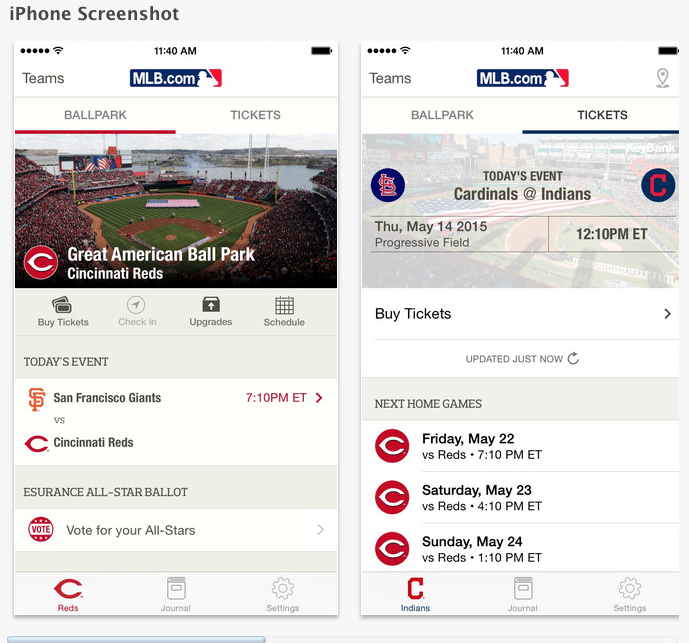 This entry was posted in Communities, Technology and tagged Best Cincinnati apps, Business Journals App, Cincinnati Apps, Cincinnati Bengals App, Cincinnati City Hall app, Cincinnati Food Truck Assocation app, Cincinnati Library app, Cincinnati Metro App, Cincinnati Parking Meter App, Cincinnati Parks app, Cincinnati Reds app, Cincinnati Symphony and Pops app, Cincinnati Zoo app, Downtown Cincinnati app, Red Bike App, Sibcy Cline Realtors app by susanaknabe. Bookmark the permalink.